YES, I quote Hulk. For those of you who haven’t watch “The Avengers” don’t read this. And for those of you who understand the context of the sentence then perhaps you need not to read this further too. And for those of us who doesn’t, carry on. I myself understood the context only after watching it twice; first in a movie theater and second, a torrent downloaded camera version with an occasional Japanese dub in between. Nevertheless it was okay. I love the movie. Mark Ruffalo did an amazing job portraying Hulk and surpass the acting of his predecessor Edward Norton and Eric Bana for the same. Anyway leaving the acting to the critics, remember the scene where Bruce Banner utters the above quote, just before transforming into Hulk and later when he transforms, smashed humongous metal lizard-like creatures in the vicinity of Manhattan. It was emasculating. Centering only on Hulk’s role and character, many of us who have seen the movie questions the transformation of Hulk in a manner that, on his first transformation in the helicarrier he doesn’t distinguished between friends and foes, wreaked havoc inside the helicarrier, almost killed Black Widow who was save only by the timely intervention of Thor, whereas on the second transformation he was perfectly sane aiding his fellow Avengers and only destroying the bad guys. The answer lies in the complexity of Bruce Banner’s psyche. Banner is a loner and a tortured genius. He is always in a state of meditated anger thereby channeling his ability to transform into Hulk whenever he wants. He is learning to be comfortable with that anger retaining his normal self and despite his attempt, never is fully in control of his extraordinary power. His transformation can be voluntary and involuntary triggered by a situation beyond his control. In the first scene, his transformation was cause by the attack of the hellicarrier as he learns that SHIELD has been lying to him, all this while being manipulated by Loki’s staff. The circumstances in which he find himself are beyond anything he had prepared himself for and so the Hulk emerges – unrestrained, uninhibited and most importantly, against his will. He acts on instinct and destroys anyone who is trying to hurt him. 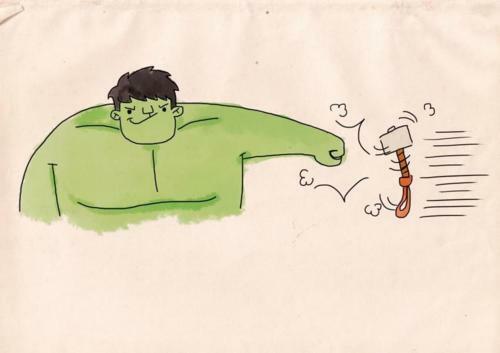 Before the second transformation, Banner came to the realization of what controlling the Hulk means by accepting the anger as a part of himself and learning to direct in a useful way thereby voluntarily changing to the “enormous green rage monster”, an expression of his repressed form. hahhah… now that i’ve watched The Avengers, this article now makes sense… Avengers ka en hma, magazine buaipui lai kha chuan ka chhiar ve tho a, ka man lo re re..lol…..
Hahahha….Thor kha k star a but Hulk kha k duh tlats lol….